File photo of taxi drivers by 2hottravellers. Philippine lawmakers are considering a bill that would penalise taxi drivers who refuse to accept fares because of heavy traffic. House bill 7774 was approved on its second reading at the House of Representatives today (Wednesday, September 12). 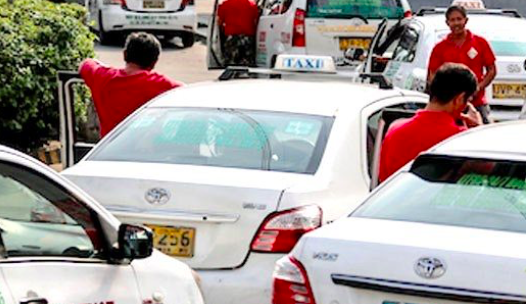 The law will establish the rights of passengers of taxis, tourist car transport services and other vehicles for hire. Drivers who break the new rule would face fines of up to 5,000 pesos, and repeat offenders could have their driver’s licence suspended for up to one year. Vehicle operators would also be subjected to a fine ranging from 5,000 to 15,000 pesos. HB 7774 still has to pass through a third and final reading at the House of Representatives. The Senate version remains pending at the committee level. Be provided with a substitute vehicle or be assisted to secure one in case of mechanical or engine trouble. If this is not possible, the passenger shall only pay the amount appearing in the meter less the flag-down or booking fee for meter-oriented fare vehicles. These rights would have to be prominently displayed inside any vehicle if the bill eventually becomes law. Do you mean refusing fares is actually part of the ‘Franchise’ agreement that these drivers sign on with the government to operate a taxi service? How are they gonna enforce this? I contacted the LTFRB hotline before about a problem driver and there was no response. Most of the drivers rent the taxis for 24h, good luck keeping track of them. Part of the reason the economy is Duteriorating is that businesses are burdened with excessive rules. BTW, most of these proposed rules would make the taxi shortage worse. Some drivers would lose their licenses, and others would quit out of frustration. A driver needs a break to eat, but he’s forced to take a passenger because of fear he’ll be prosecuted. How would this law be enforced? Each case of alleged refusing would be the driver’s word vs. the passenger’s. Drivers would have to provide receipts? Fares will have to be raised to pay for the equipment. Decide on lighting systems inside the vehicle? It’s not safe to drive at night with interior lights on. This p a t h e t i c government reeks. So prefer not to have rules at all? Or you just want to rant against President Duterte, who by the way, just in case you don’t know, was elected by a HUGE MAJORITY of the citizenry? He was elected by 16M. Duterte voters are the kind of people who think 16M is a huge majority in a country of 110M. No, we prefer to have smart rules made by people who live by the rules. I thought Smartmatic is a division of the Liberal Party of the Philippines. I am pretty sure the ‘Franchise Agreement’ have a provision that it’s illegal to refuse fares. And “Another Juan says” has a very good point. And these Lawmakers will create ‘another Law’? Does Congress have anything better to do?